They appear on the tips of new upright stems and are readily visible, being fully exposed to the sun. 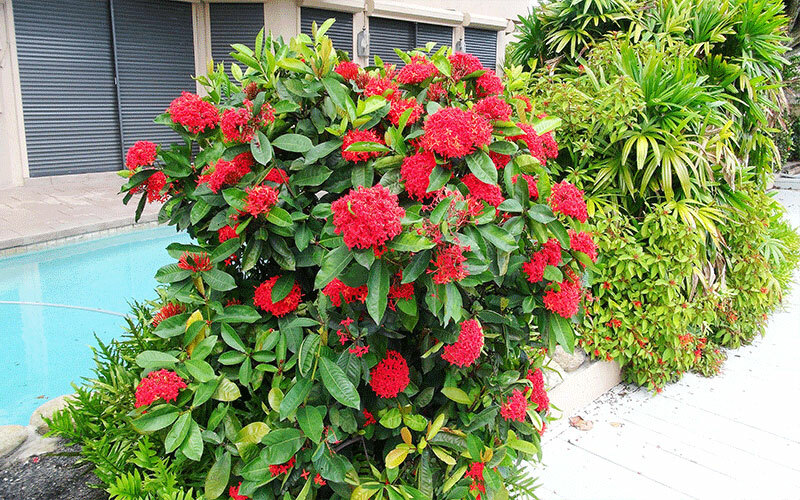 Maui is a bright red-orange variety that produces a medium size shrub with medium size foliage. 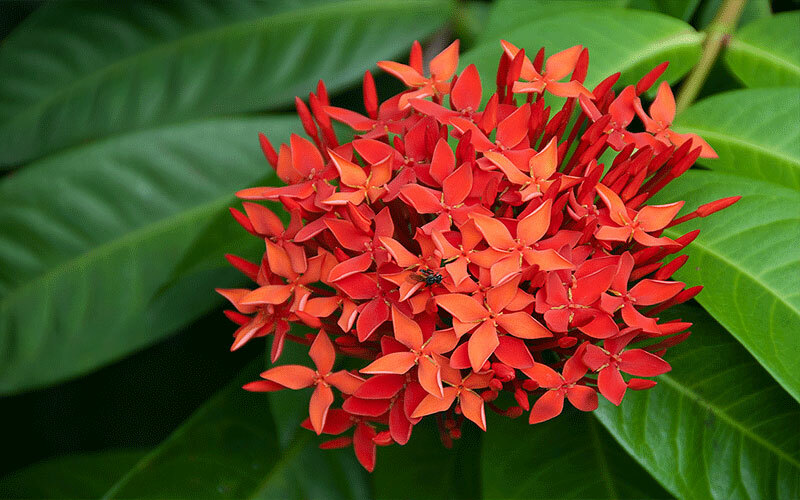 Dwarf Ixora or Taiwanensis come in red, yellow, pink and orange. They are ultra-compact, often growing to no more than 8 to 10 inches. They bloom in great profusion, but are slow to re-bloom. If space is a problem, try these compact tropical jewels. 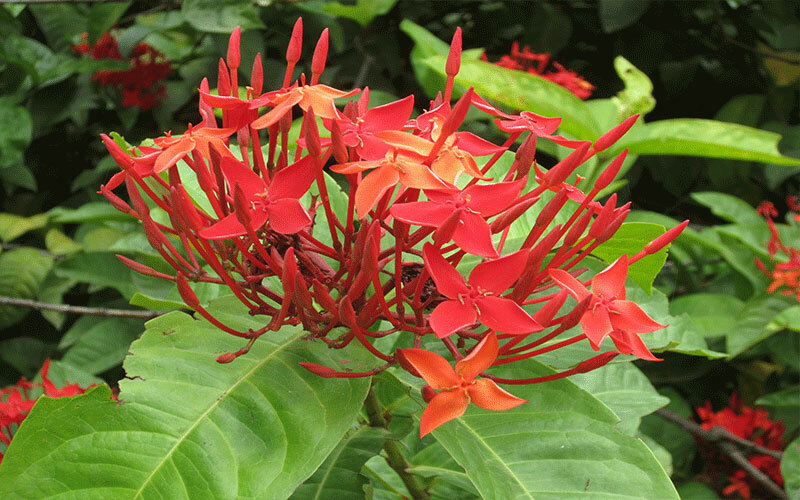 Plant your Ixora in a sunny, raised area, using plenty of planting mix or soil mix to raise the level of the bed. Dig a hole 1.5 to 2 times wider than the root size, but no deeper than the original pot. Rest the root system on the undisturbed soil in the bottom of the hole and fill around the roots with your prepared bed mixture. Water your new plant with a root stimulator, following directions on the label. 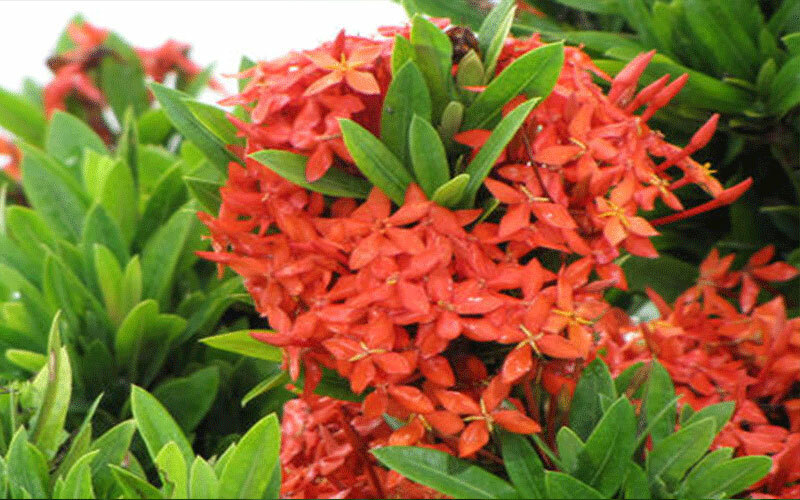 Watering Ixora: Ixora are very sensitive to drying out and should be watered regularly and thoroughly, but care should be taken to not over water your planting. Deep watering will ensure that roots will grow deeply and can be protected from drought. Like many tropicals, ixora is susceptible to mealy bugs and spider mites. Insecticidal soaps are effective, as is Orthene spray (follow all directions on the manufacturers label). If your planting is healthy and gets plenty of sunshine, your plants will be likely to fend off many pests of their own.